Fences is the story of a responsible yet otherwise flawed black garbage collector in pre-Civil Rights America who, in August Wilson's hands, rises to the level of an epic hero. Deemed a generational play, it mirrors the classic struggle of status quo, tradition, and age, versus change, innovation, and youth. During its 1987 Broadway run, Fences garnered four Tony Awards, the New York Drama Critics Circle Award, and the Pulitzer Prize. It has been produced around the world and is one of the most significant African-American plays of the 20th century. This reference is a comprehensive guide to Wilson's dramatic achievement. The volume begins with an overview of Wilson's aesthetic and dramatic agenda, along with a discussion of the forces that propelled him beyond his potentially troubled life in Pittsburgh to his current status as one of America's most gifted playwrights. 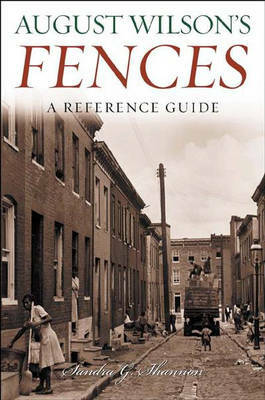 A detailed plot summary of Fences is provided, followed by an overview of the play's distinguished production history. The play's historical and cultural background and themes are explored, as is Wilson's dramatic art. The reference closes with a look at the critical and scholarly reception of Fences and a bibliographical essay. Included are rare photos from the play's Broadway premiere and its 1999 premiere in Beijing.